These three threats could cause an investment in Royal Dutch Shell to head in the wrong direction. Those who have invested in or follow Royal Dutch Shell know that shareholders have not been happy with the company's direction of late. The oil major's large capital investment program left little for shareholders, who have grown a little tired of seeing money poured into underperforming projects. This year, management began to transform the business into a smaller, leaner, more profitable company that focuses on cash flow generation for shareholders. It sounds like a great plan, but a few things could keep investors from cashing in on this program. Let's look at three issues that could keep shares of Shell from increasing despite this stockholder-friendly program. 1) It hasn't been cost effective at adding new production and reserves. If we were to evaluate integrated oil and gas companies on their ability to add new reserves to their portfolio, Shell would come out on top. Over the past five years the company has maintained a reserve replacement rate of greater than 120% -- this is important, because 100% means oil and gas were added to reserves at the same rate they were produced, and above 100% means more reserves than production. Adding new oil and gas reserves to a company's portfolio isn't the only challenge, though. Hundreds of companies do this on a regular basis. The real way to separate the wheat from the chaff when it comes to oil and gas producers is the cost to add those reserves. Royal Dutch Shell hasn't exactly been performing up to snuff in this regard in recent years. According to the most recent Ernst & Young reserves survey of 50 major oil and gas producers, Royal Dutch Shell has been the worst among its integrated peers based on reserve replacement costs -- the amount of money spent to add a barrel of oil equivalent to its reserve base. In fact, its reserve replacement costs were only lower than two of the 50 companies surveyed. A knee-jerk reaction to a higher number like that would be to think Shell brought on more oil than natural gas, which costs more to develop but is generally considered more valuable. This isn't the case, either: Of the 620 million barrels of oil equivalent that were added to Shell's reserves in 2013, close to 86% was natural gas. One thing to consider with these numbers, though, is that Shell has had a relatively unsuccessful exploration program in the recent years. Of the $5 billion it spent on exploration, $3 billion delivered only dry holes. There is no guarantee that Shell will improve its exploration success rate, but that rate is pretty low for even risky exploration regions. It is reasonable to expect the company to have better success going forward, and for those reserve replacement costs to decline over time. If Shell can't make that happen, though, it could eat into earnings in a big way. 2) The big decline in capital expenditures may juice cash flow today, but could it compromise it further down the road? As a means to boost cash flow and profitability, Shell has started a $15 billion asset sell-off, as well as a reduction to its capital budget. Shell's management estimates that capital expenditures for this year will be 20% less than in 2013, and it plans to sell off $15 billion in underperforming assets to increase overall returns for the company. Recent earnings suggest these moves have been effective. In just the first two quarters of 2014, free cash flow was almost equal to total free cash flow from all of 2012, which was the highest annual total since the financial crisis. It's nice to see management's decisions paying off for investors right now, but it does make one wonder if the company is sacrificing its future by not spending on growth projects. Based on where Shell is today in this asset sale and divestment program, it's far too early to tell if it will have any material long-term impact, but it is certainly something that investors should keep an eye on over the next couple years. Unfortunately for Shell, a higher percentage of its production assets are in places with higher levels of geopolitical and operational risks than many of its peers. A great example of this is Nigeria. Theft, sabotage, and other dangers have been a persistent problem negatively impacting the company's bottom line. On several occasions in recent years, these risks have led Shell to enact force majeure on operations at its LNG facility in the African nation. In 2013, Shell estimates that it lost $1 billion per month in revenue because of problems in Nigeria. These kinds of operational risks are not unique to Shell, but it is far more exposed than the rest of the integrated majors. Shell normally derives more than 10% of its revenue from this country when it is not being stolen or sabotaged, and Nigeria is slated to be a major growth engine for the company in the coming years. If these problems persist, it will almost certainly keep shares of Shell from reaching their full potential. 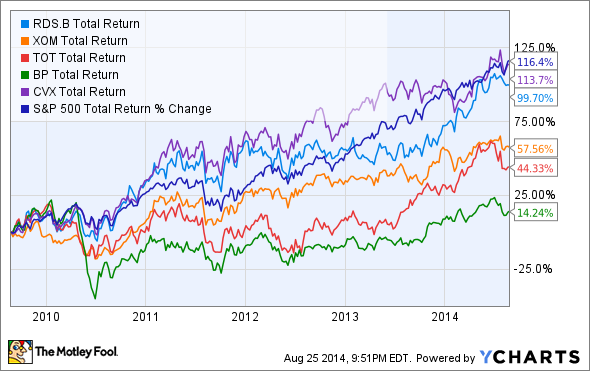 Over the past five years shares of Shell have nearly doubled on a total return basis, topped only by Chevron. That said, Shell and all of its peers have underperformed the S&P 500. Each company has struggled for various reasons, but among the major reasons Shell has been held back are its weaker returns on capital and its struggle to bring on new reserves at a competitive cost. Unfortunately, geopolitical risk is impossible to predict, so it's something the company and its investors will have to live with. As investors, though, we can evaluate the other risks associated with Shell over the next several years by monitoring its reserve replacement costs and the types of capital projects it initiates. If these costs do not come down and the new project pipeline starts to dry up, then shares of Shell could be headed down pretty fast.